Here is a small selection of comments we've received from guests who've stayed with us at HorseridingSpain. Just click on a button read more and it will show the full riders comment. "... I feel compelled to write and thank you for the truly wonderful riding holiday I had. 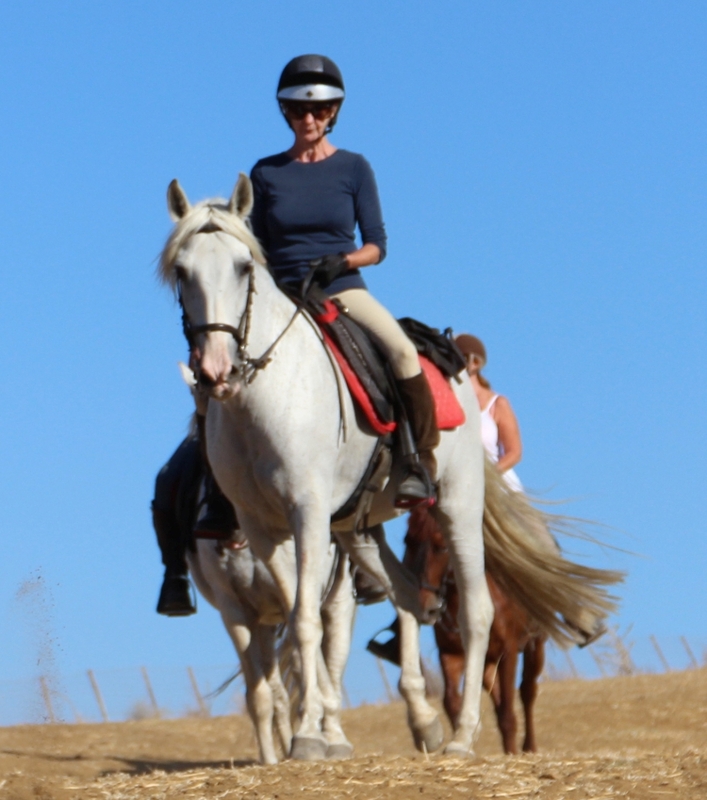 As I am sure you can understand, taking a 'busman's' holiday whilst working for an equine charity ( manager of ILPH Norfolk centre / World Horse Welfare ) put extra pressure on me to find a good riding holiday where the welfare of the horses was of paramount importance. Your centre excelled on both counts ! 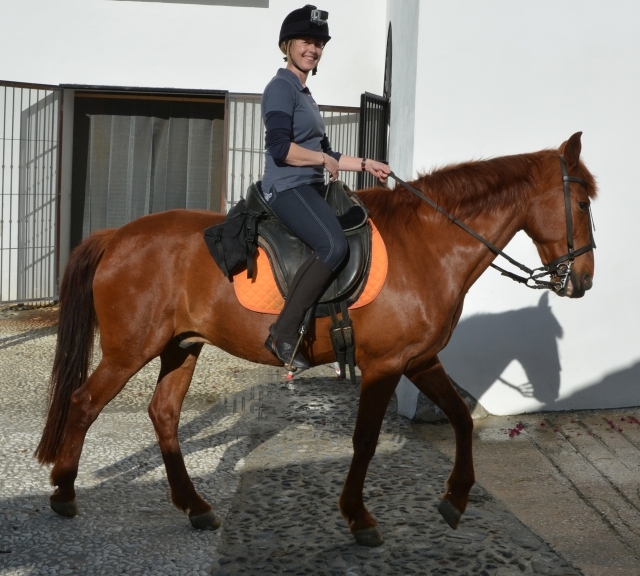 You both have a love and passion for horses in general, and Andalucians in particular, which is infectious. To see so many extremely fit, sound, strong and well shod horses was a breath of fresh air. I know how hard it is to get horses looking and feeling like this so you must take a huge amount of credit for presenting your guests with horses of this calibre. The riding frequently took my breath away. I would just think I had seen the best view in Spain and we would turn a corner and see another equally as stunning. The Andalucian Horse Show had me in tears in 30 seconds ! Beautiful. Your hospitality and attention to detail was exemplary and you made us all feel very welcome and special. 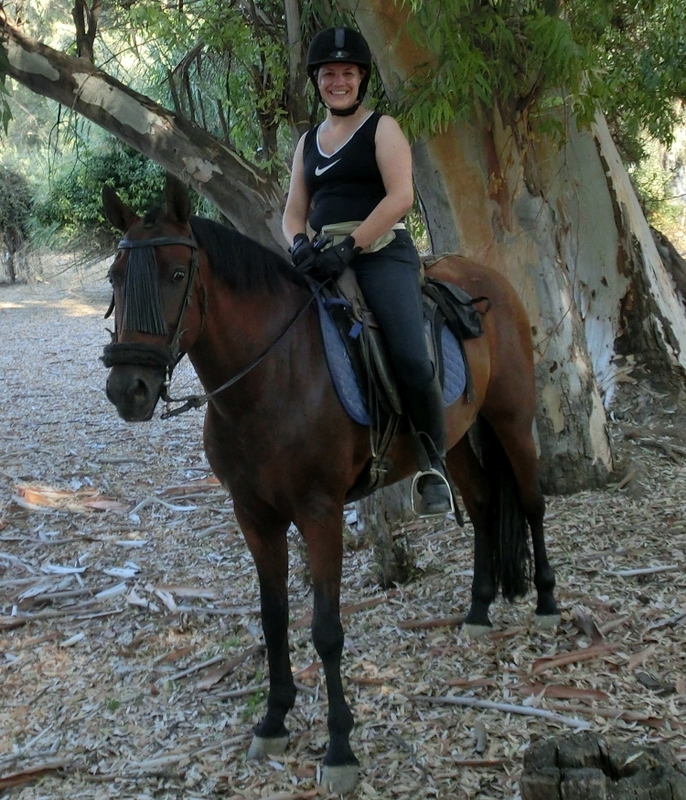 It was a privilege to ride such happy, contented and responsive horses. You really do deliver all your web site says, and more. Your riding holiday exceeded all my wildest dreams and I will be one of your many returners. Please keep up the good work !" "Even though I have just completed my 7th riding holiday with yourselves (which is testimony to your horses and hospitality in itself! ), I just want to thank you both so much for making my various friends so very welcome. Over the past 6 years I have brought along five different friends and recommended at least another four to visit you. Each and every one has been wowed by your horses, the riding and your hospitality. As you know, several have already returned without me! I always feel totally confident that any one I recommend to visit you will have an amazing time and this has always been the case. Take care and keep up the good work ! via Facebook - in German "Es war einer meiner schönsten Urlaube, entspannt, super freundlich und liebenswürdig, Miranda und Giles sind sehr wertvolle Persönlichkeiten, sie arbeiten mit den Gästen und den Pferden im Einklang, das Essen ist wunderbar, die Landschaft atemberaubend, wir wollen sofort wieder zurück🏇🌺"
via Facebook - in English "It was one of my most beautiful vacations, relaxed, super friendly and amiable, Miranda and Giles are very valuable personalities, they are working with both the guests and the horses with consideration, the food is wonderful, the scenery breathtaking, we want to get back right away 🏇🌺"
"Yet again I am compelled to put pen to paper to thank you both for the most perfect riding holiday. I have lost count as to how many times I have personally ridden with yourselves or the number of friends I have brought along! This time it was with two friends from my new home in New Zealand (& a couple more wonderful friends from the UK!) so a lot of effort, time & money had been invested. Never once did I worry that my personal recommendation would fall short. Indeed my Kiwi friends, Judy & Claudia, voted their stay with yourselves as the overwhelming highlight of their trip to Spain & believe you me, we had a GREAT trip! Yet again your selfless hospitality, wonderful accommodation, great food & most of all, your extraordinarily wonderful horses made our stay with yourselves very very special. Both Judy & Claudia plan to come back (yes, from NZ!) & I am already booked in for next November with at least 3 new Kiwi's so your reputation is absolutely global now :) Please keep up the great work. You provide an extraordinary & magical holiday experience & every time I visit you I leave more inspired & riding better than when I arrived. Hasta el proximo año !" via Facebook - in German: "Liebe Miranda, lieber Giles! Gerade einmal 2 Wochen wieder zu Hause und der Alltag hat einen leider viel zu schnell wieder ;-) Aber die Erinnerungen bleiben, sind sehr lebendig und zaubern mir immer wieder ein seliges Lächeln auf die Lippen! Ich habe die Tage bei euch wirklich sehr genossen - es ist so ein friedlicher Ort, eine kleine Oase, die ihr dort aufgebaut habt. Eure Herzlichkeit und die familiäre Atmosphäre machen es einem leicht, sich wohl zu fühlen und den Urlaub richtig zu genießen. Die Ausritte haben mir viel Spaß gemacht und die Landschaft rundherum ist wirklich schön und beeindruckend. Am beeindruckendsten waren aber immer noch eure Pferde!! Sie sind nicht nur sehr lieb und zugänglich, fein geritten und in bester Verfassung, sondern es hat mich irrsinnig überrascht, wie trittsicher und unerschrocken sie sind - in jeder Situation habe ich mich gut aufgehoben gefühlt auf Gitana :-) Vielen, lieben Dank - thanks a lot - und hoffentlich sehen wir uns wieder!! Alles Liebe, Ursi aus Wien"
via Facebook - in English: "Dear Miranda, dear Giles! Just 2 weeks back at home and everyday life has taken control way too fast again ;-) But the memories remain very much alive and they magically bring a smile to my lips every time! I really thoroughly enjoyed the days I spent with you - it's such a peaceful place, a little oasis, which you have built there. Your warmth and the family atmosphere make it very easy to feel at home and to enjoy the holiday to the fullest. The rides were lots of fun and the surrounding countryside is really beautiful and impressive. Yet most impressive of all, were still your horses!! They are not only very sweet and accessible, well schooled and in the best condition, but I was tremendously surprised at how surefooted and brave they are - I felt in good hands on top of Gitana in every situation :-) Thank you very much - thanks a lot - and I hope we shall meet again!! Happy birthday, ursi from Vienna"
"I've just returned from a holiday with Giles and Miranda and it really was exceptionally good. The accommodation and food are brilliant, and the setting is delightful (with a very welcome swimming pool!). 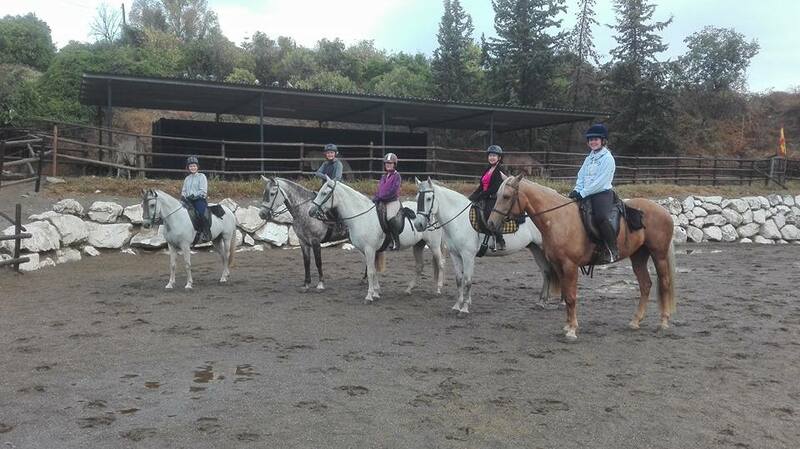 Their horses are extremely well cared for and lovely animals, very capable with good temperaments and a pleasure to ride. 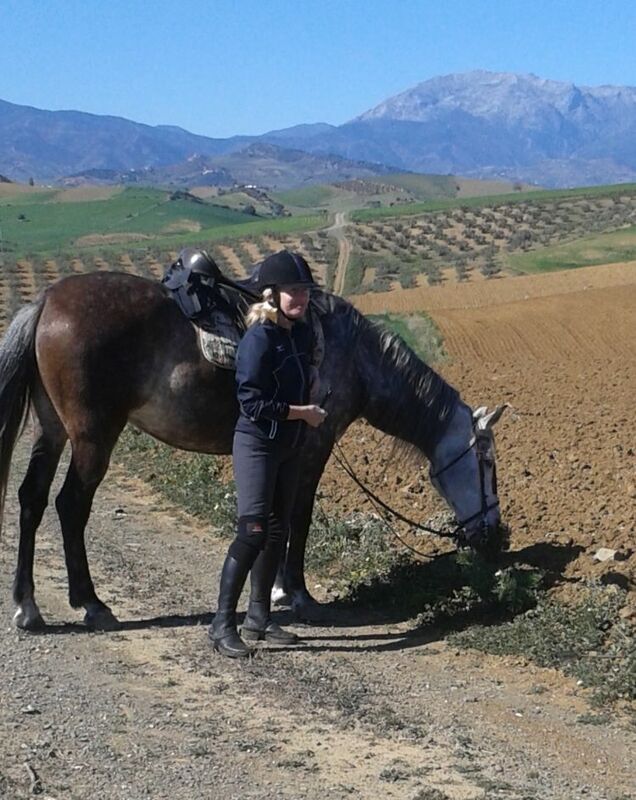 Long hacks show spectacular, panoramic views of the beautiful Andalucian countryside, and breathtaking scenery. However, what clinches it for me and makes HorseRiding Spain stand out is the warmth and good humour of Giles and Miranda. They are immensely thoughtful, kind and considerate and do their utmost, very successfully, to give everyone a wonderful holiday. 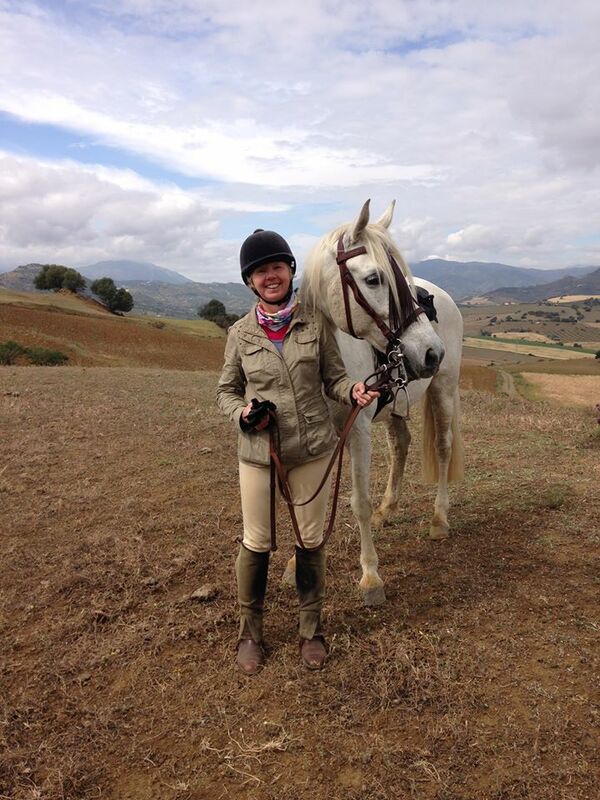 I'm at a complete loss to find any negative aspects about HorseRiding Spain, only very positive ones. Sue, Surrey - October 2016"
Via Facebook: I feel like it's time for a little commercial break ;-) Together with my friend Sabine I spent 5 days in Andalucia with the wonderful Miranda and Giles at their beautiful finca. Such sweet and reliable horses, enchanting views, amongst a herd of rescue dogs and cats and great human company :-) I don't really remember another holiday that was zo peaceful and relaxing. Which would't have been possible without Miranda and Giles, who went out of their way to take the best possible care of us. Same goes for the way they care for and take care of all of their animals. 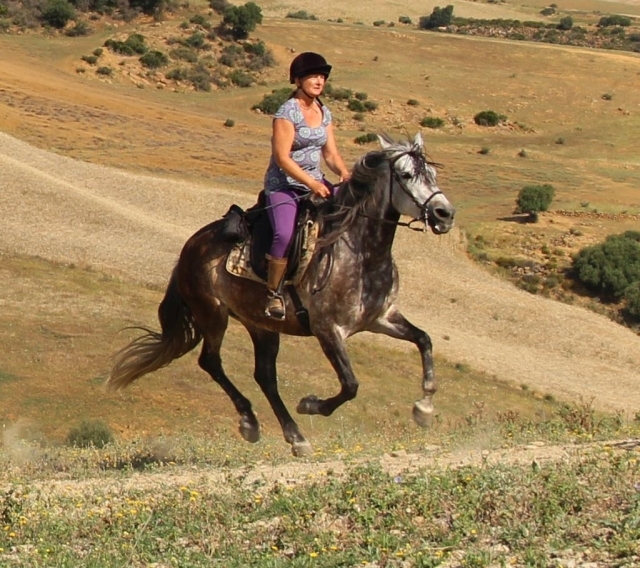 I HIGHLY recommend this place to other (intermediate/advanced) riders, who want to enjoy a wonderful holiday in Spain! That are a lot of superlatives to tell you I had a great time smile :-) Thank you and I'll definitely come back! Dear Giles & Miranda. Just a quick note (time flies) to still thank you for the great time we spent with you in Coin. Lucille really enjoyed it all & I've luckily got the great photo('s) to actually prove it! She is set up to come back next year, as she already has put some of her birthday money aside to save! She really didn't want to leave and she really is missing you & the horses...and even though I loved Malaga and swimming in the sea, I missed the feel of your lovely spot, hospitality & Coin, so guess for now you are stuck with us for another visit next year. Giles and Miranda, thank you so much for making my week with you one of the most enjoyable experiences of my life ! You both made me feel so welcomed as soon as I arrived and there was never a dull moment around you ! The accommodation was really clean and comfortable with very good air conditioning and the swimming pool was perfect for relaxing and cooling down in the sun. You took great care to match everyone in my group with the right horse and I was thrilled to ride the gorgeous mare Savannah! 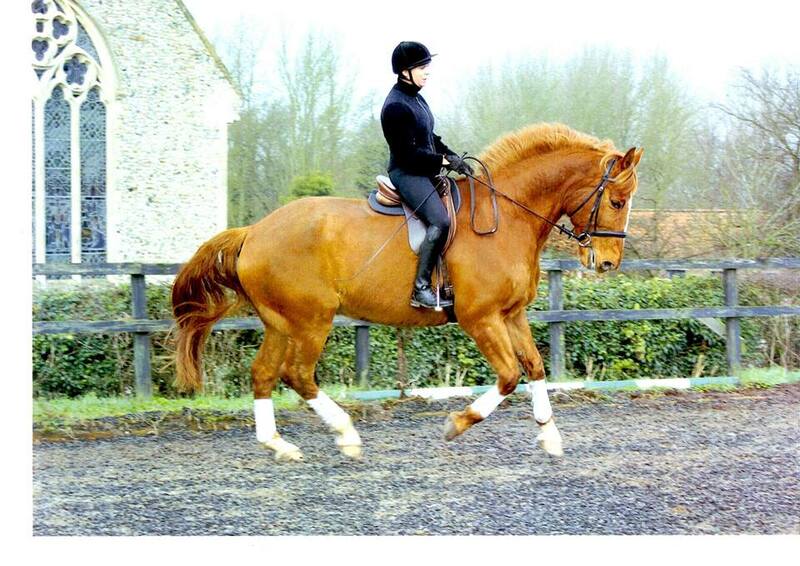 She was incredibly fit and healthy and one of the most genuine and hard working horses I have ever ridden. All of your horses have such wonderful personalities and they all really enjoyed their work which was lovely to see. The rides varied each day, with each one showing stunning scenery and having lots of opportunities for faster paces. The food was absolutely delicious and you catered very well for intolerances and dislikes ! The Andalusian horse show on Thursday was a breathtaking example of Spanish riding and it was thoroughly enjoyed by everyone who attended, non-riders included ! You both really went the extra mile to make my holiday the best it could be and even when the unfortunate weather conditions meant that we could not go on our usual morning ride, you organised a private show of a Spanish stallion trainer which was incredibly inspirational. Overall, I want to say a huge thank you because I had the best week of my life and made memories that I will treasure forever. You will definitely be seeing me again next year ! On his 2nd riding holiday with us for the whole month of June: The return of a rider. - Whenever one has a spectacular dream one does not want to wake up. Well, sometimes reality may get beyond that. Days when you pinch yourself, once, twice even more. Trying to assure yourself that it's the realty that seems like a wonderful dream. I have that feeling. However, I cannot wait to wake up. Odd?! Only to get back once again and relive all and every single joyful and adventurous moment. Knowing that not only the experience will be the same but Giles and Miranda will raise the bar and make it as if it's a whole new one. Our beautiful horsey friends are as loving, healthy and happy as ever. The horses look into your eyes then flap their lips to tell you welcome back we remember you human. Thanks again Giles and Miranda. Till next time. 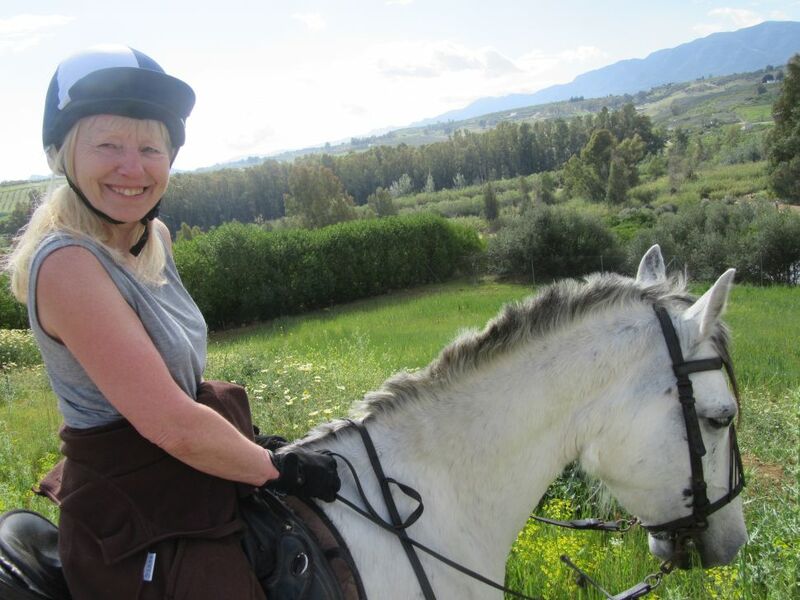 As published on TripAdvisor/ Horseriding Spain: "I have just come back from a wonderful week riding with Giles and Miranda. The horses are beautiful, fit and so well looked after and conditioned. 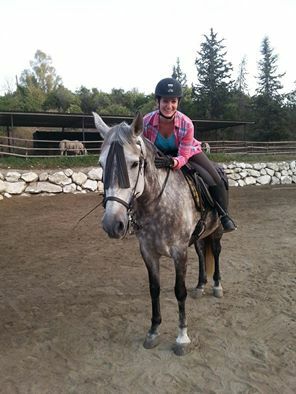 I rode Tormento a gorgeous mare who was so sure footed on unbelievable terrain. The actual rides were stunning, with every ride being different from the day before. Every new view was breathtaking. 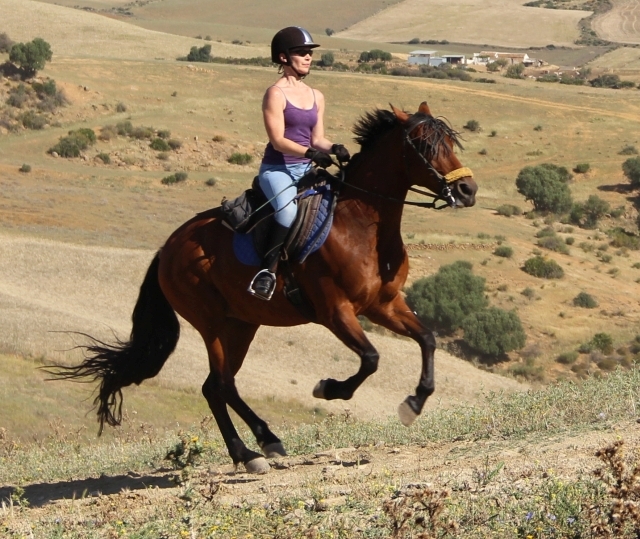 There are a lot of opportunities to trot, canter and gallop - so you certainly will not be bored!! Giles and Miranda are the most accommodating hosts you could ever wish for. They could not do enough for you. Their horses are so very well looked after and they match their guest superbly to their horse.The accommodation is situated in a tranquil valley nestled in the village of Coin - but you would think you were a million miles from civilization - so peaceful and restful. Miranda's cooking is wonderful using local ingredients much of it grown in the surrounding country side. The other guest were a joy. I'm ready to book for next year. If you are thinking of a riding holiday for an intermediate/advanced rider this is the one for you. Go for it !" 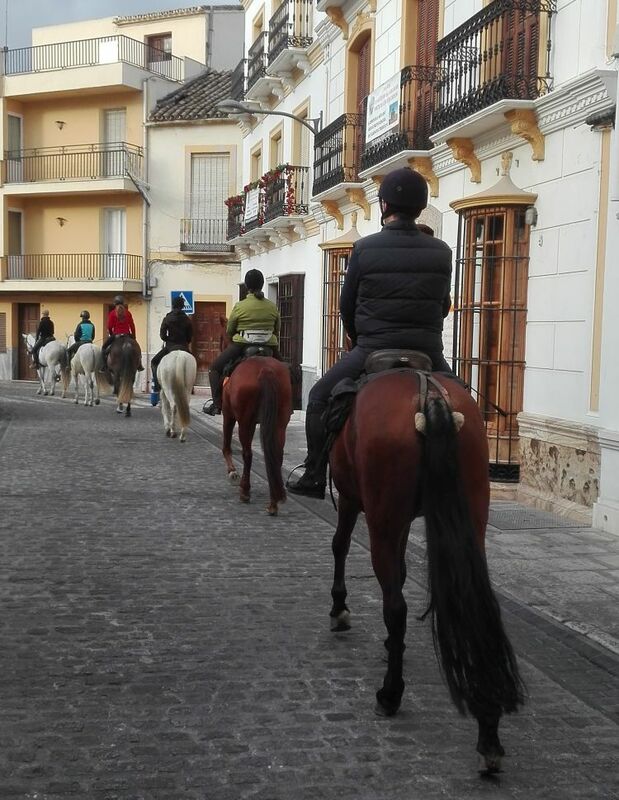 As published on TripAdvisor/ Horseriding Spain: "I spent a couple of days sightseeing in this wonderful, very Spanish, part of Spain and 3 days riding. The horses are amazing, very well trained and very well looked after by Giles and Miranda. The horses welfare comes first, as it should be. The circular rides are different each day and last from 4 - 5 hours in the most stunning countryside. It is my intention to return to this little bit of paradise. I was well looked after with good accommodation and great food by the lovely Giles and Miranda - nothing was too much trouble. " Via Tripadvisor:"What is there not to love about the complete experience of staying here. The location is fantastic, great scenery, tranquil and away from the stresses of every day life. 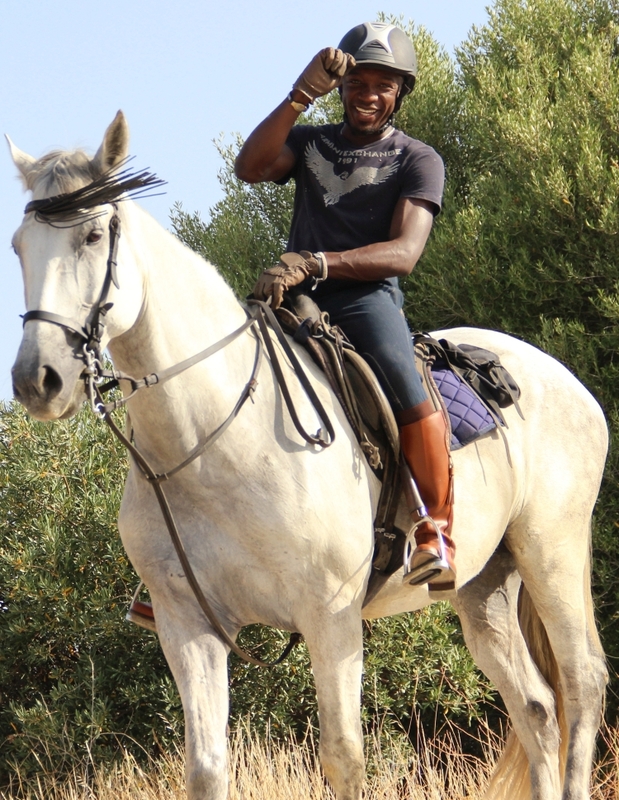 The horses are beautiful, responsive and a pleasure to ride. The accommodation, food and everything about this place just make you want to come back again and again. I have just returned from my second visit and met some great like minded people. Giles and Miranda ensure you are well looked after and make you feel like part of one big family. Looking forward to a return trip." 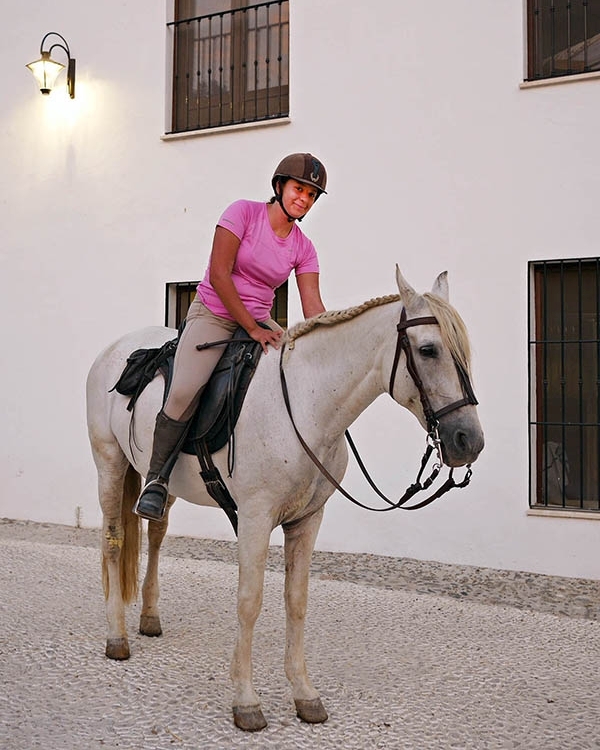 "Dear Giles and Miranda, You and the horses (especially Guitana) were absolutely amazing...the best time ever. I'll be back. 🙏🍀"
"Thank you Giles and Miranda for another wonderful week riding with you through Andalucia. As always your hospitality was second to none, the food (and wine!) 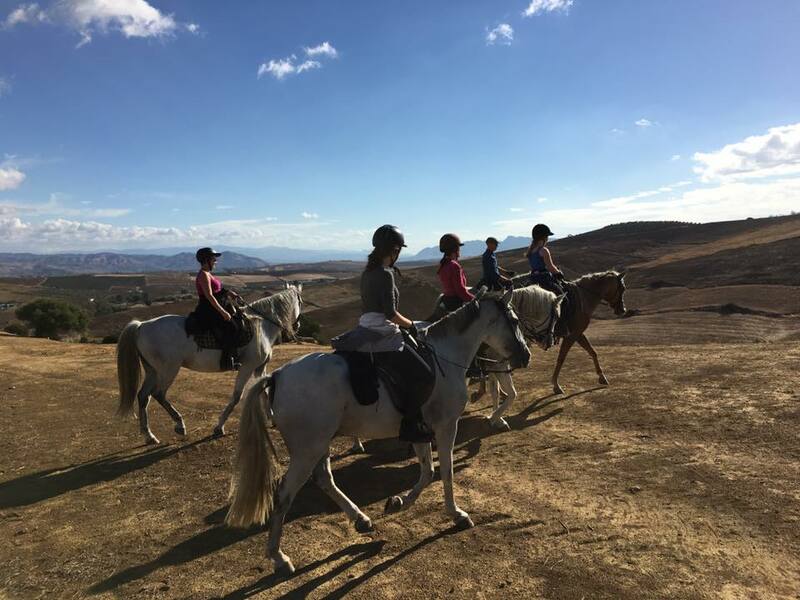 delicious, and of course, your beautiful horses... "
And on Tripadvisor - Horseriding Spain: "If you are looking for a holiday riding fabulous Spanish horses through the Andalucian countryside, look no further! Hosts Giles and Miranda provide the warmest of welcomes to their beautiful valley, hidden below the town of Coin; the accommodation is lovely; the home cooked food delicious and, best of all, the horses are truly wonderful. Each ride, takes a different route through this stunning countryside and you will ride though forests, long rivers, up and down hills and always with amazing views. The horses are superbly well trained, sure-footed and trustworthy, yet still retain their individuality. These are not riding school plods! 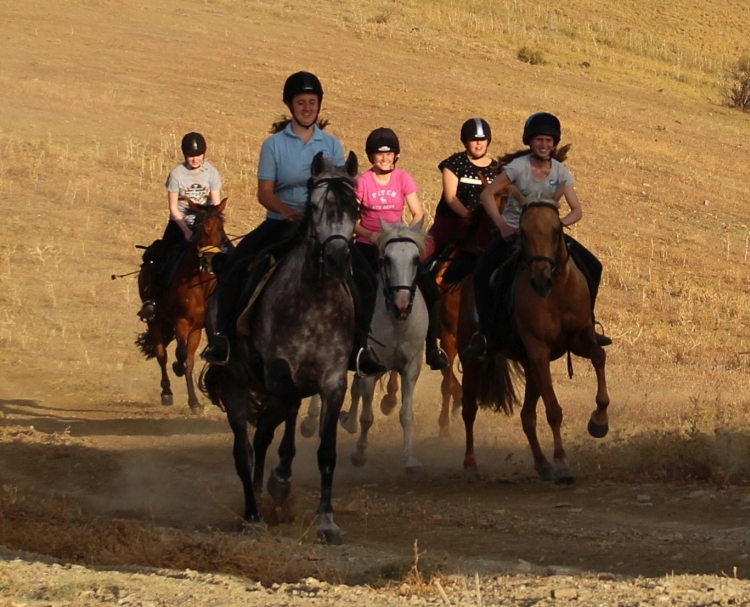 There are never more than 6 riding guests at one time so the whole atmosphere, riding and socialising, is friendly and personal and you don't ever feel lost in the crowd. 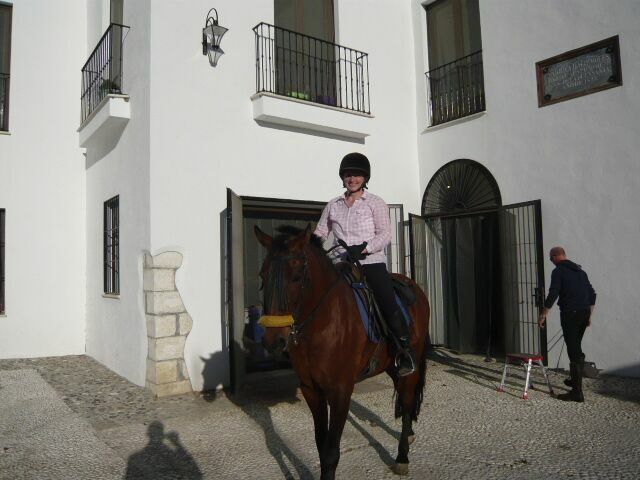 I would also recommend Horseriding Spain if you are a single rider, you will be made very welcome. 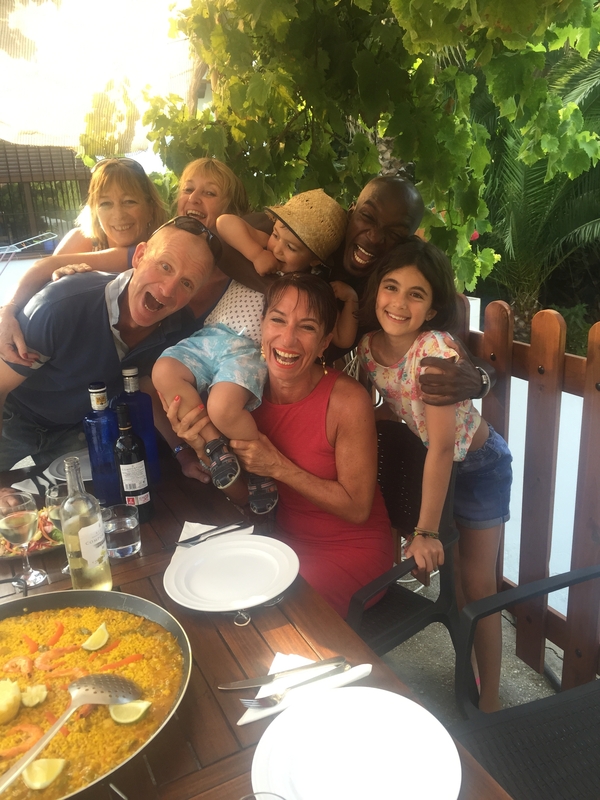 This was my third holiday with Giles and Miranda and it most certainly will not be my last!" "Miranda and Giles - fabulous week again. Thank you so much. Really loved it and had the greatest time with the beautiful Nieves and Lucera. Can't wait till I can come back again!!" "Hi Giles and Miranda.I’ve been meaning to write since getting home last Saturday to say how much I enjoyed EVERYTHING about my stay with you. The location, horses, accommodation, swimming pool and of course the food - it far exceeded my expectations! Your rides have brought a whole new meaning to happy hacking. To me, there is no greater pleasure than having a long ride on a responsive horse enjoying the beautiful countryside – with great weather too! Sam and I definitely chose the perfect time of year with the gorgeous smell of the orange blossom. 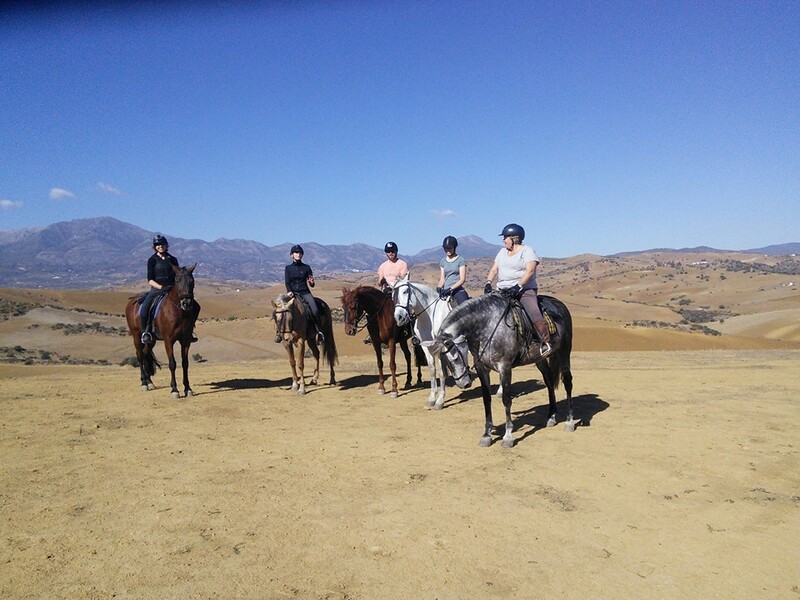 with best wishes Ginny"
via Tripadvisor - HorseRiding Spain: "We have just returned from a fabulous week's riding with Giles and Miranda. 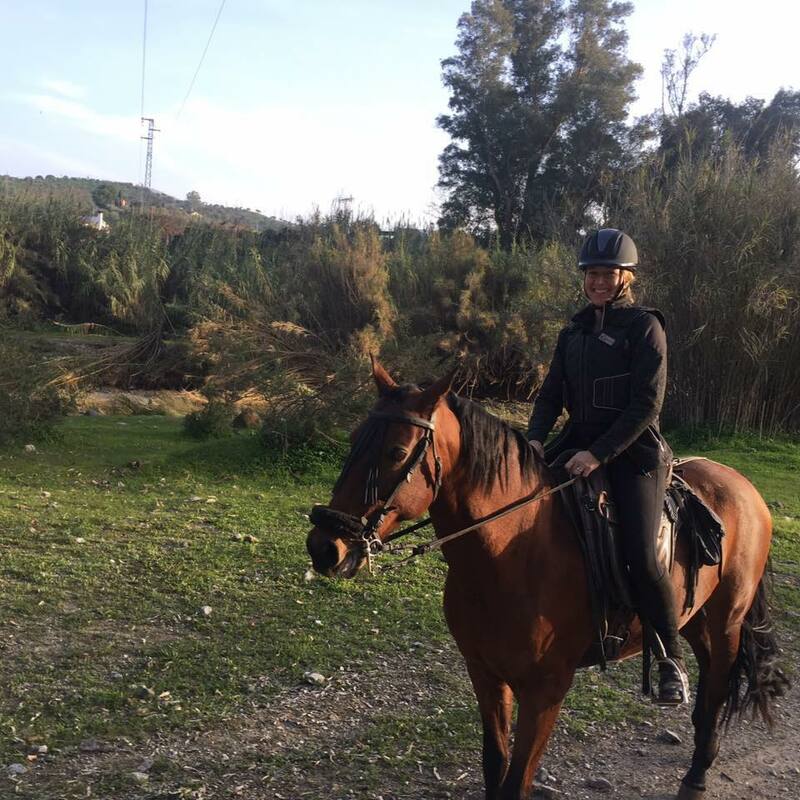 The horses are beautiful, especially Tormenta and Gitana who were surefooted and fit and looked after us whilst riding in stunning Andalusian scenery. Giles and Miranda are excellent hosts. Our apartment was clean and comfortable and the food prepared by Miranda was amazing...lovely tapas for lunch and really tasty home cooked meals at night. The ranch is lovely, well kept and just 10mins walk from the centre of Coin which is a lovely, traditional Spanish town with shops and restaurants. There is a regular bus service to Malaga, the old town is a lovely day trip for the rest day. We also visited Mijas which was pretty too. I would recommend this holiday, I haven't stopped talking about it since I got back! Thank you Giles and Miranda for a fabulous holiday. " "Dear Miranda and Giles, I wanted to let you know how wonderful my week was with you and all the horses, cats and dogs. My idea of heaven. You both made me feel very welcome and the food was delicious with varied vegetarian options for me. I absolutely loved your apartments and I miss the stallion outside my window. Coin is just my sort of place without all the tourism stuff. I also enjoyed my day in Malaga and the churches and museums , so much to see. I do hope I can improve my riding but I appreciate all you did for me and your utmost patience. Thank you and I do hope to visit you both again. Love Nikki "
"Kan verkligen rekommendera denna upplevelse i Coin till alla ridentusiaster som vill rida spanska hästar i underbar natur och få träffa detta fantastiska värdpar Giles och Miranda som tog hand om oss på bästa sätt och lagade så god mat. Mysig gård i utkanten av den fina staden Coin i Andalusien, 30 min. från Malaga. Du måste vara ridvan eftersom det är långa ridpass varje dag. Boka snarast denna fantastiska ridresa! 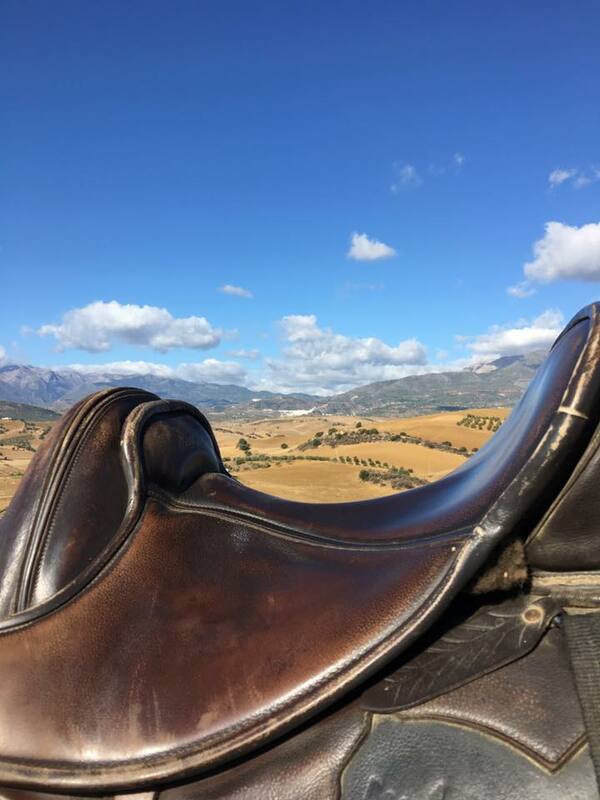 Hälsningar Gitt Broberg"
"I can highly recommend this experience in Coin for any riding enthusiast who would like to ride Spanish horses through beautiful countryside whilst being very well looked after by hosts Giles and Miranda (who also prepared such good food) . Cosy accommodation on the outskirts of the lovely town of Coin in Andalusia , 30 minutes from Malaga. You must be experienced riders. 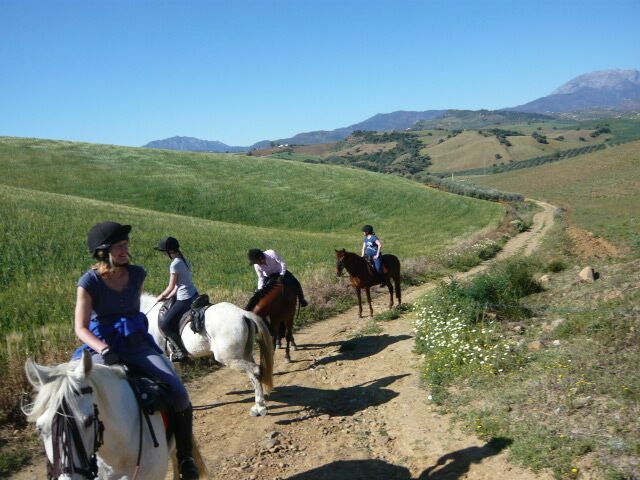 Book this amazing riding holiday as soon as possible ! Greetings - Gitt Broberg"
•	gute Tempi – beschaulich oder auch konzentriert im Schritt, dann locker im Trab über längere oder kürzere Strecken und dann auch mal im flotten Galopp, manchmal sogar mit Endspurt – da war die kleine Nieves ganz gross! •	abwechslungsreiche Landschaften mit grandioser Aussicht, die auf dem Pferderücken eindrücklich wahrgenommen werden können: romantische Flusslandschaften mit grossen Eukalyptusbäumen und grünem Grund, Olivenhaine, wunderbar duftende Orangenhaine, auch schon vereinzelt blühende Mandelbäume, ein Pinienwald, Berge und Täler …. •	und natürlich Ihr beide: mit grossem Einsatz und viel Geduld habt Ihr die Pferde ausgezeichnet auf ihre Aufgabe vorbereitet, und mit viel Engagement kümmert ihr Euch um die Gäste. Ihr habt alles daran gesetzt, dass diese Ferien zu meinen schönsten Ferien gehören. Das ist Euch gelungen. Diese Zeit wird mir immer in bester Erinnerung bleiben! Herzlichen Dank! 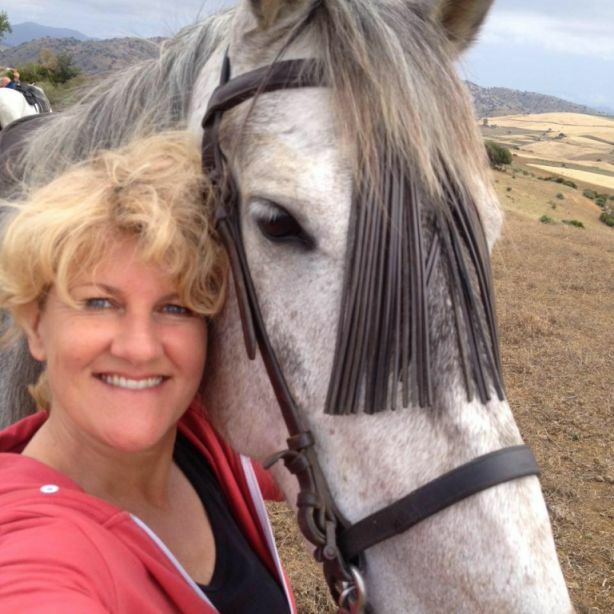 Andrea aus Bern (Schweiz)"
•	and of course you two with great dedication and lots of patience, you have prepared your horses excellently for their task and with lots of engagement you look after your guests. You have done your utmost to make this holiday one of my best holidays. You have succeeded. This time will always remain a fondest memory. Thank you very much ! Andrea from Bern (Switzerland)"